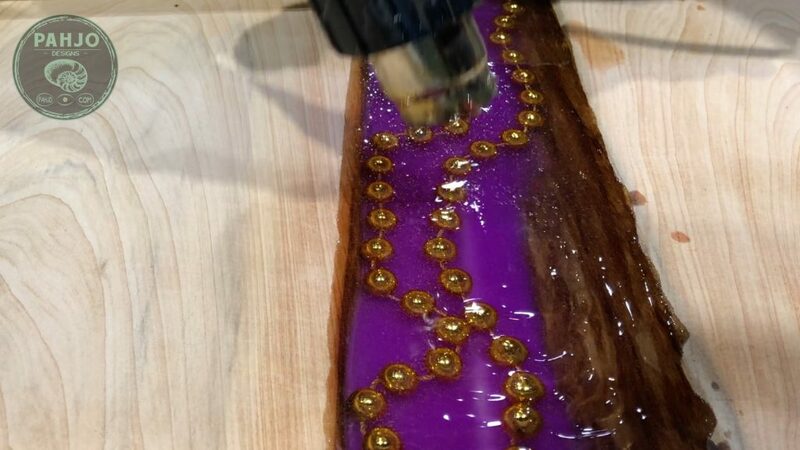 In this resin art tutorial, I show you how to make LED Epoxy Resin Wood Wall Art inspired by Mardi Gras in New Orleans. 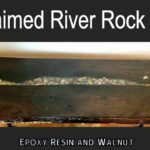 For your convenience, I’ve compiled a complete list of epoxy resin tools and material I use most often. Click HERE to see the list. 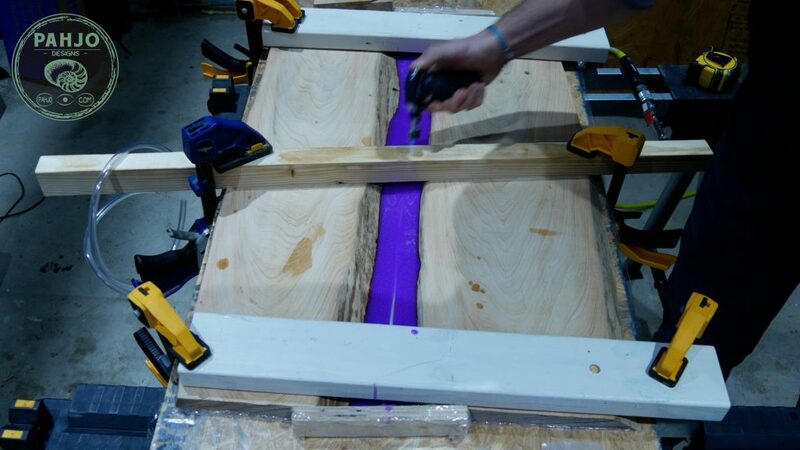 I decided to build an LED epoxy resin wood wall art and experiment with a few resin techniques. Additionally, I made a few major mistakes during this project. In turn, I had to get creative to salvage the project so be sure to read the entire post to learn more. 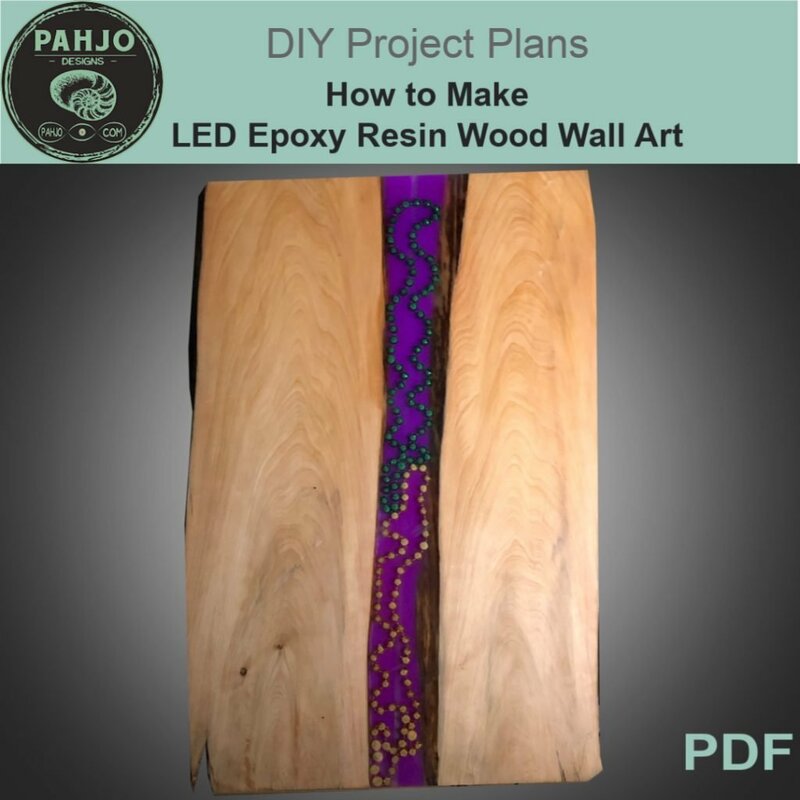 This LED epoxy resin wall art contains purple photoluminescent powder (glow powder) in the bottom resin layers. Additionally, I used a technique to create a hollow tunnel for the LED light strip. 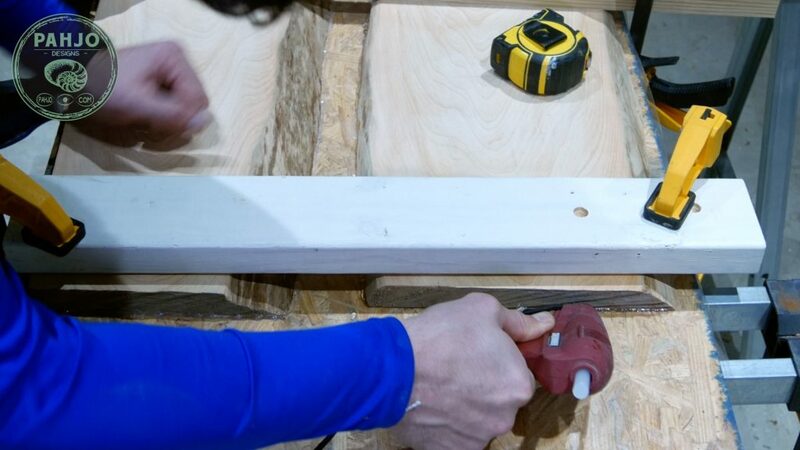 Essentially, the hollow tunnel makes it easy to replace the LED light strip. 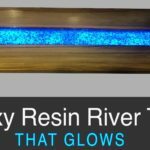 This resin art tutorial contains many useful techniques & tips to help anyone who wants to create LED epoxy resin wood wall art. 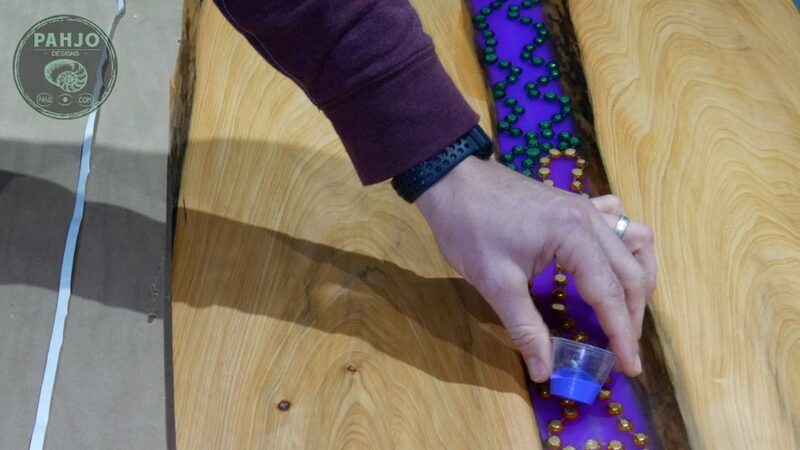 Furthermore, this wood wall art was inspired by Mardi Gras. 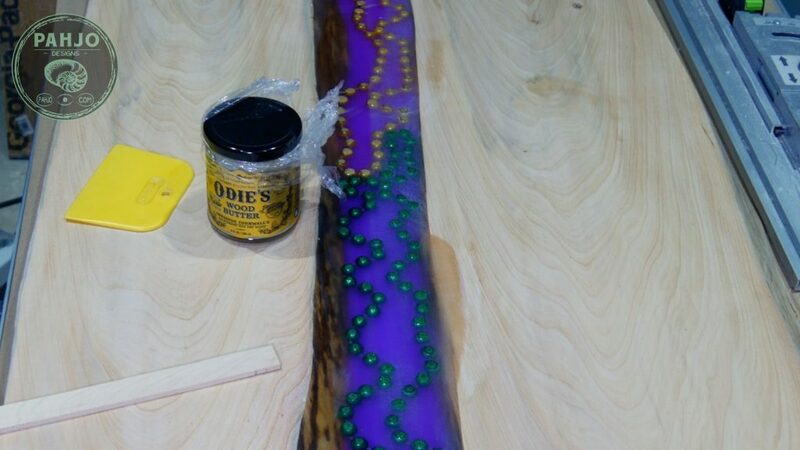 I was born and raised in south Louisiana where Mardi Gras is a big part of our culture. 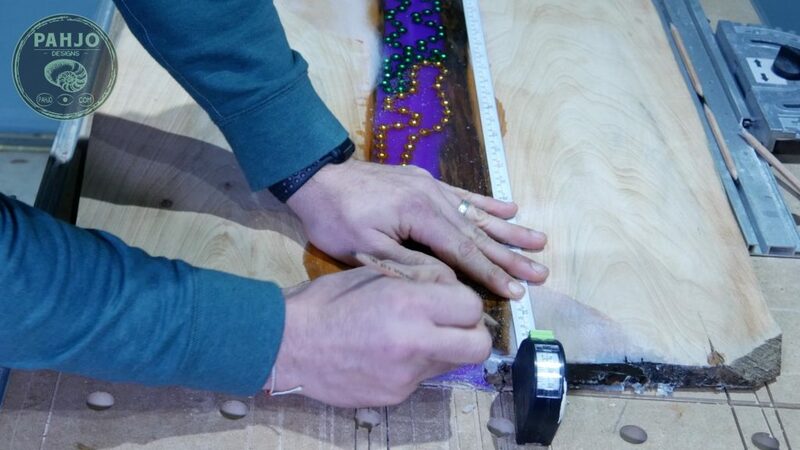 Also, visit my Mardi Gras Ladder Chair tutorial to learn how to build a Mardi Gras Ladder Chair. 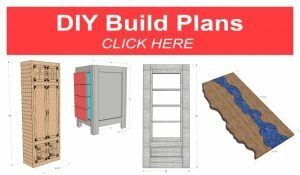 Currently, I’m working on DIY plans for this project. Complete the form below and I’ll notify you as soon as they are ready for download. Success! Now check your email for a special discount code good for any of my existing and new digital plans. These plans should be ready very soon. This piece of cypress wood is roughly 5 inches thick and very uneven. Obviously, this is too thick for a resin art project. 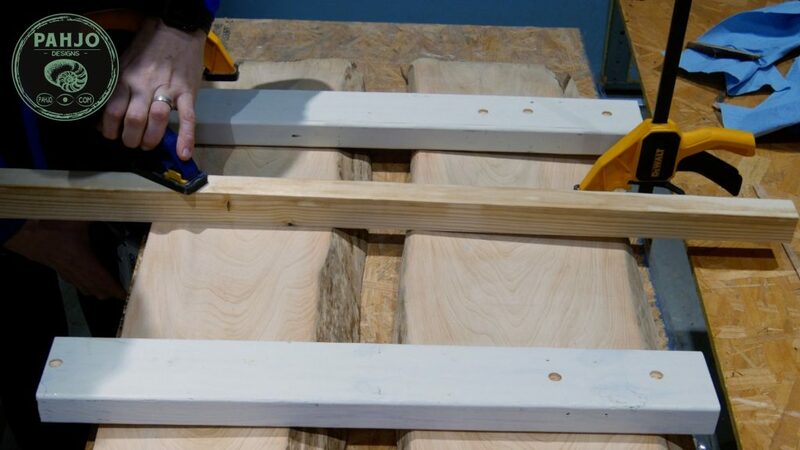 In order to use the entire piece of wood, I needed to resaw it into 3 – 1 1/4″ each. 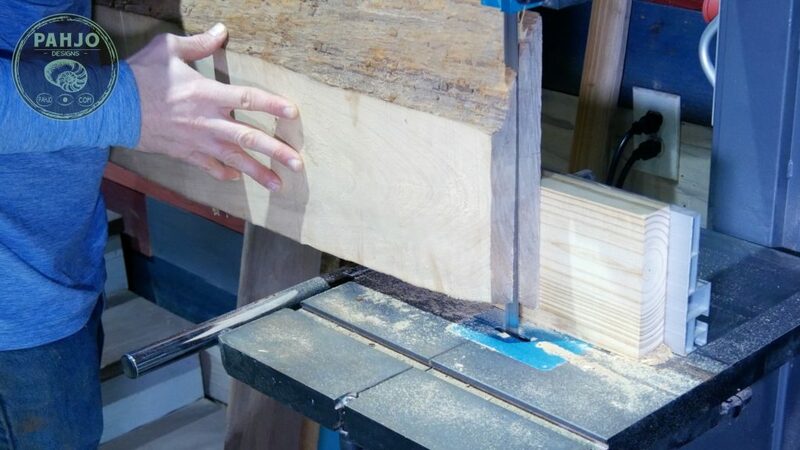 First, I used a flat 2×6 to use as a bandsaw resaw jig. 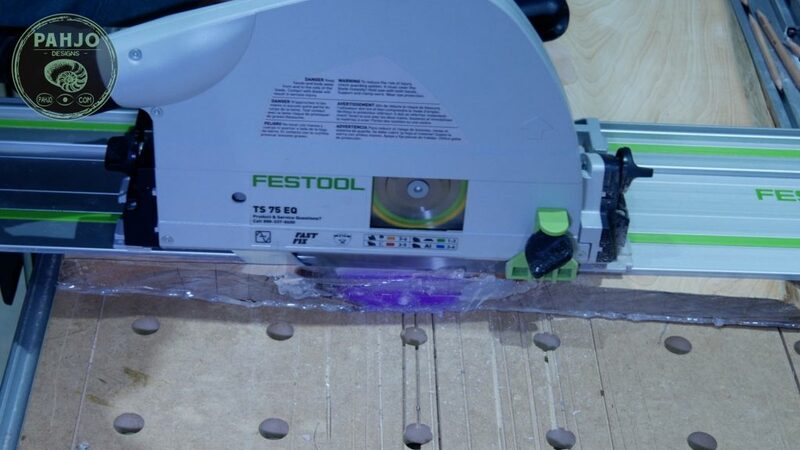 This resaw jig provides a flat surface to use as a point of reference for the first cut. Next, I drilled various pilot holes and countersunk each of them. 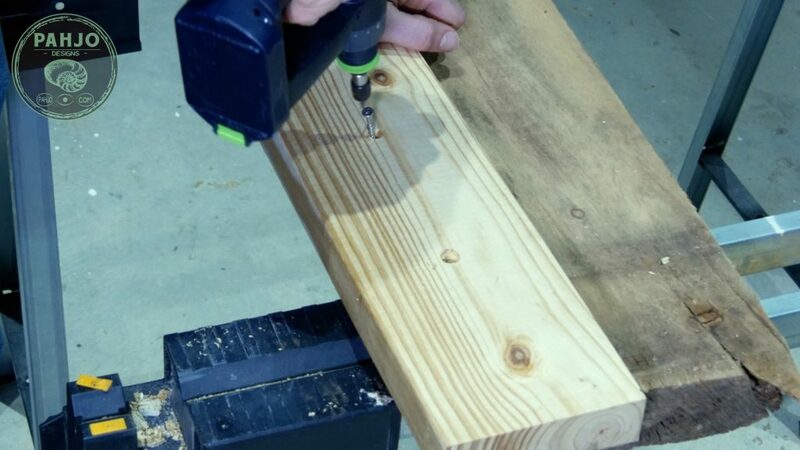 I used screws slightly larger than the 2×6 to secure it to the cypress. 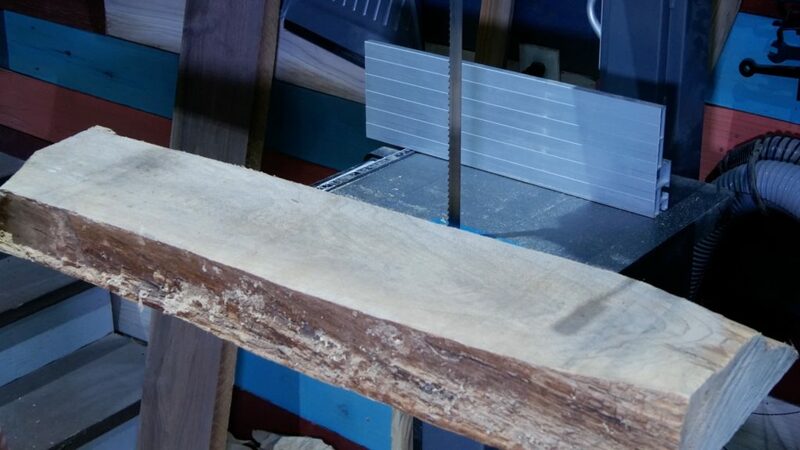 Then, I made a mark on the cypress 1.25″ and setup my bandsaw fence so the mark lined up with the blade. I slowly ran the wood through while allowing the blade to do the work. I removed the screws and ran the cypress wood through the bandsaw 2 more times with the flat side against the fence. 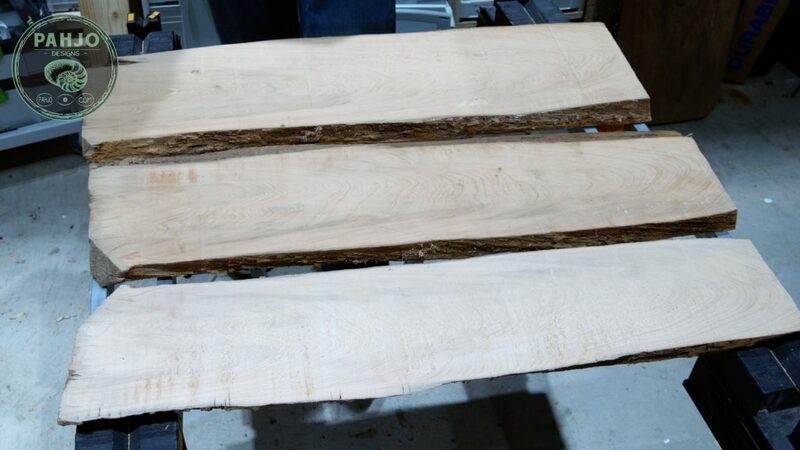 Once complete, I had 3 beautiful pieces of live edge cypress wood. 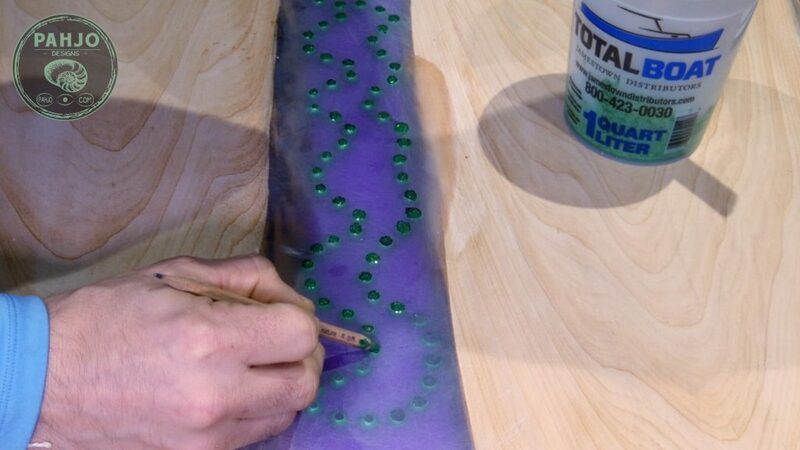 First, I used the same piece of particle board as in my previous resin wall art project. However, the tape was torn in a few spots. So, I covered the particle board with tape. Next, I covered the entire piece in furniture wax. Keep in mind, vaseline works just as well as furniture wax. 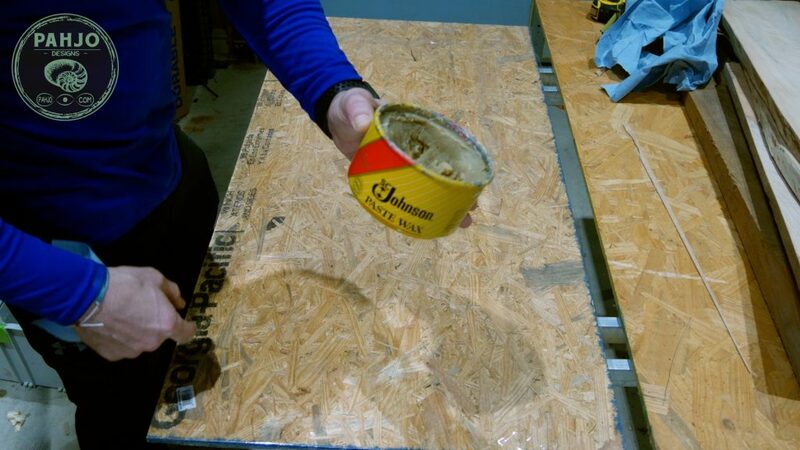 After the packing tape was covered in resin, I secured the wood to the particle board with scrap wood cauls and clamps. Next, I sealed on each side in the middle of the river and on each end. 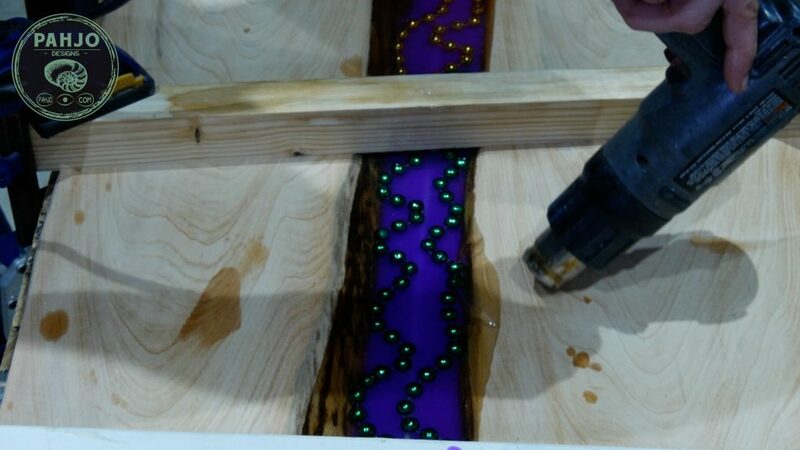 In previous projects, I glued UV LED light strips to the bottom of the river. Ultimately, I use UV LED light strips to charge glow powder if sunlight is not present. Obviously, this isn’t ideal because the LED light strip falls over time. Plus, it is visible. 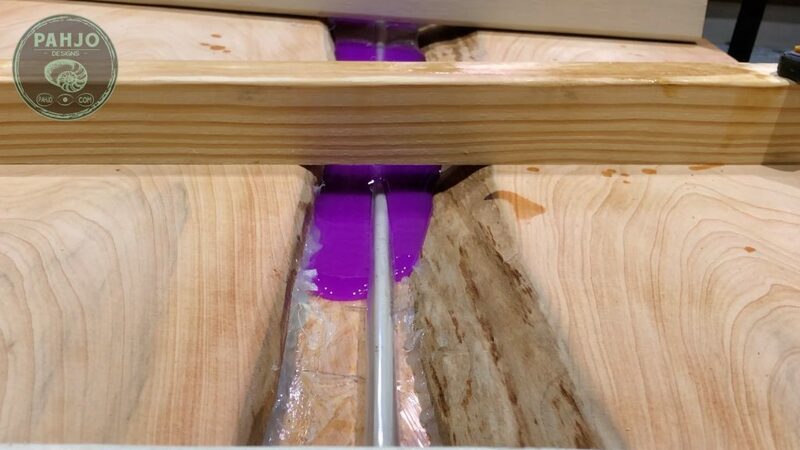 In turn, I thought of a way to create a hollow tunnel in epoxy resin large enough to hold the UV LED light strip. 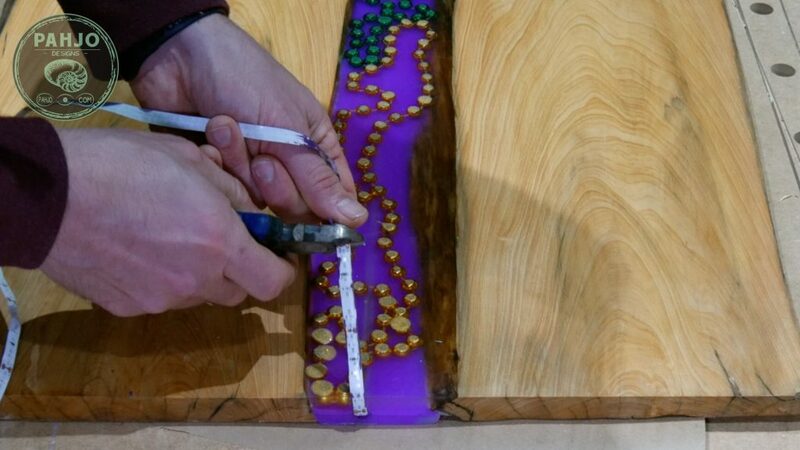 Learn how to embed led strip lights in epoxy resin. 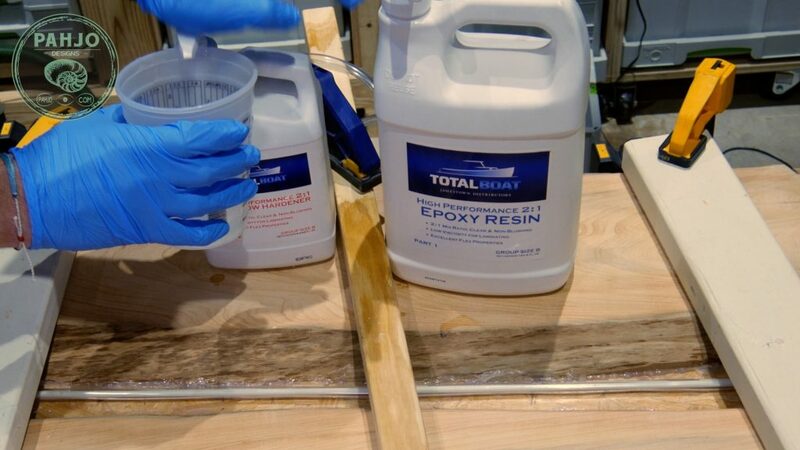 First, I mixed 16 ounces of Total Boat high performance epoxy resin. This was my first time using this resin and I really liked how it performed. 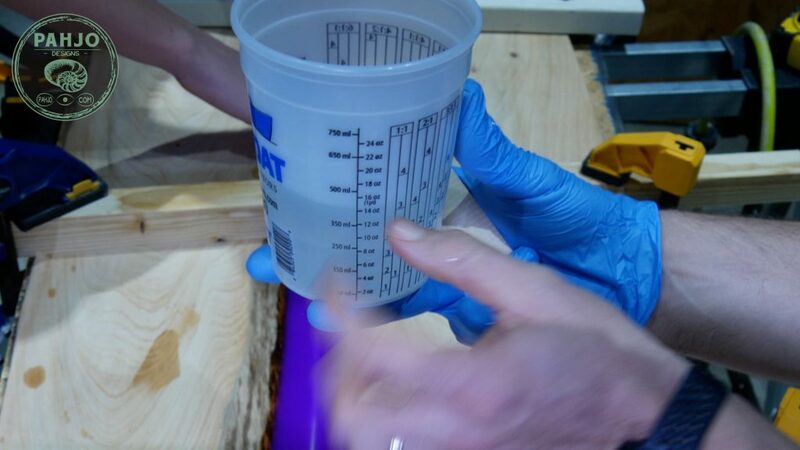 Next, I used a separate container to further mix the epoxy resin per the manufacturer’s instructions. 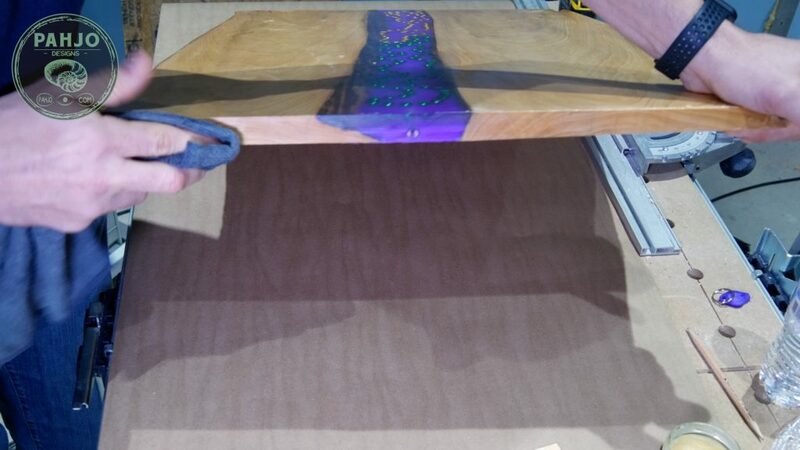 I frequently use glow powder in many of my resin tables such as this epoxy resin ocean table. Furthermore, I use glow powder from ArtnGlow because it performs the best. 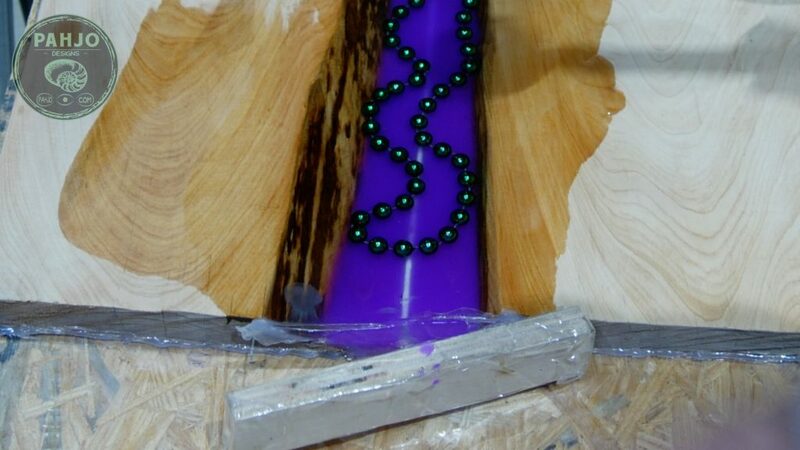 First, I added 1 ounce of purple glow powder to the 16 ounces of resin and thoroughly mixed. 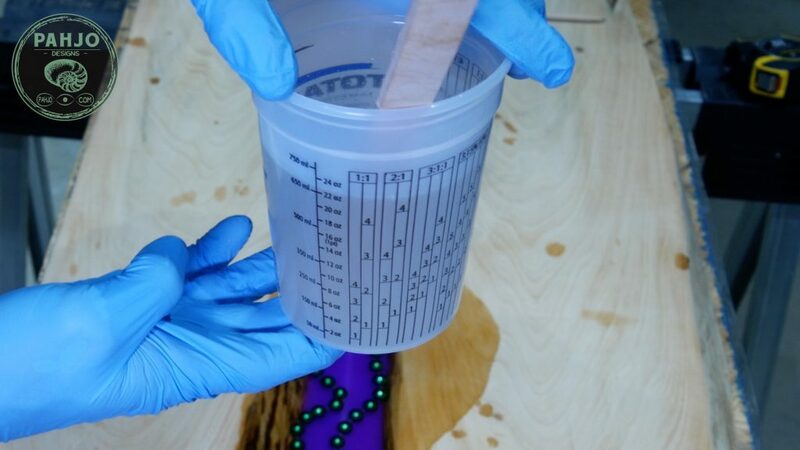 I prefer to add the glow powder after I mix the epoxy resin to ensure the resin mixes properly. Next, I poured the first layer of resin. 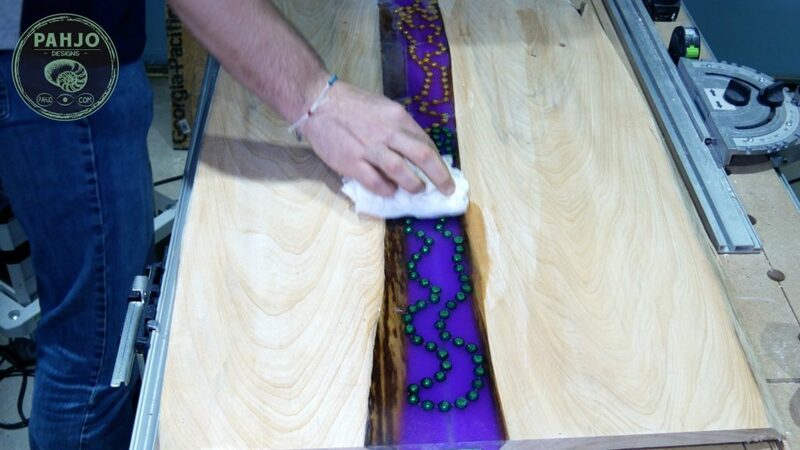 I always cover the bottom of the river with resin and check for any leaks. Ultimately, my first resin pour contains just enough resin to cover the bottom and come up about 1/8″. The small mixture minimizes the resin waste if I do have a leak. Then, I used my mini torch to remove air bubbles. 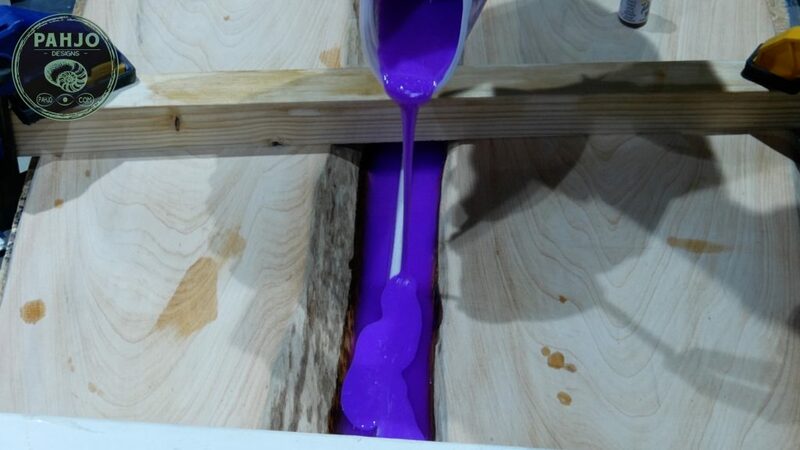 Finally, I allowed the LED Epoxy Resin Wood Wall Art to cure overnight. First, I mixed another 16 ounces of resin with 1 ounce of glow powder for the second pour. I poured the resin onto the previous layer. Then, I removed air bubbles and allowed the resin to cure for 12 hours. 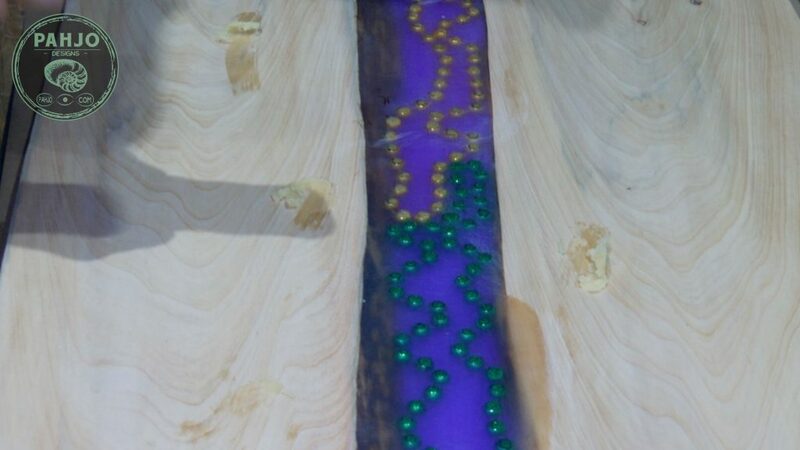 Since this is Mardi Gras Wall Art, I embedded Mardi Gras beads in epoxy resin. 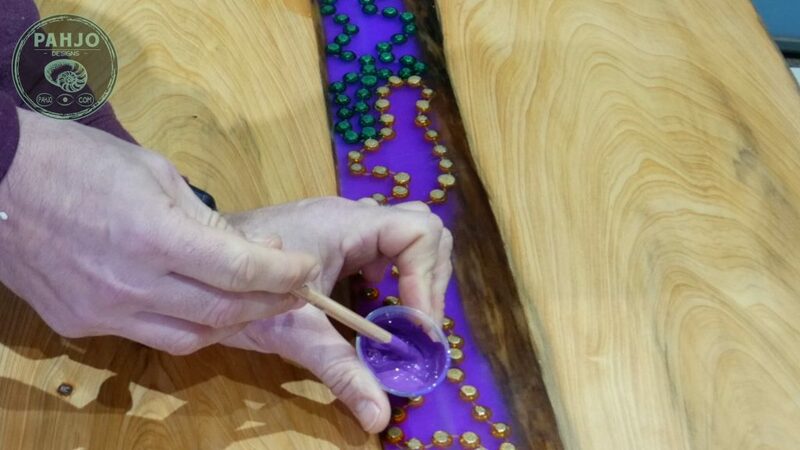 First, my son spread the green and gold beads on top of the bottom 2 layers of epoxy resin and glow powder. 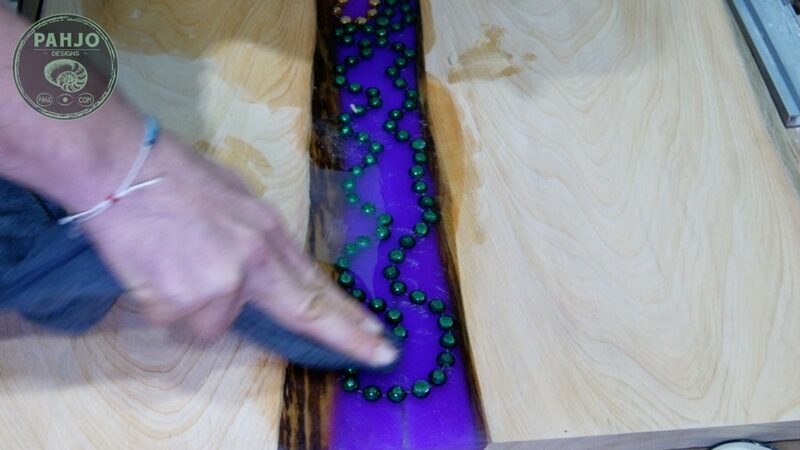 Next, I mixed 14 ounces of resin and poured the resin on top of the beads. Then, I removed bubbles with my heat gun. 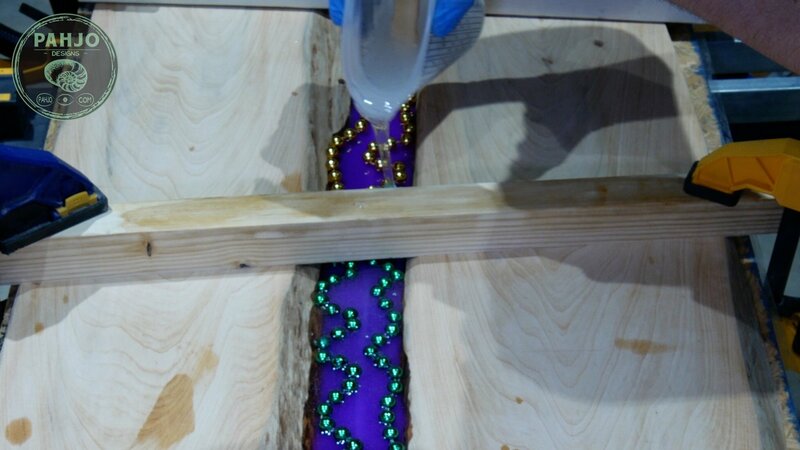 Ultimately, the heat gun works well at moving the resin around via heat. However, it may contaminate the resin with dust if dusty is present. I let the resin cure overnight. First, I mixed 22 ounces of epoxy resin. 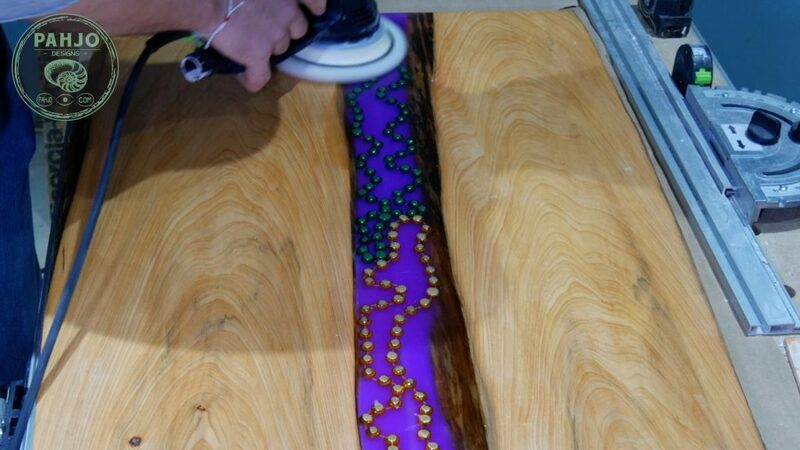 Next, I poured the resin on the LED epoxy wall art. Then, I used my heat gun to remove resin air bubbles. After roughly 4 hours, I repeated the process above. 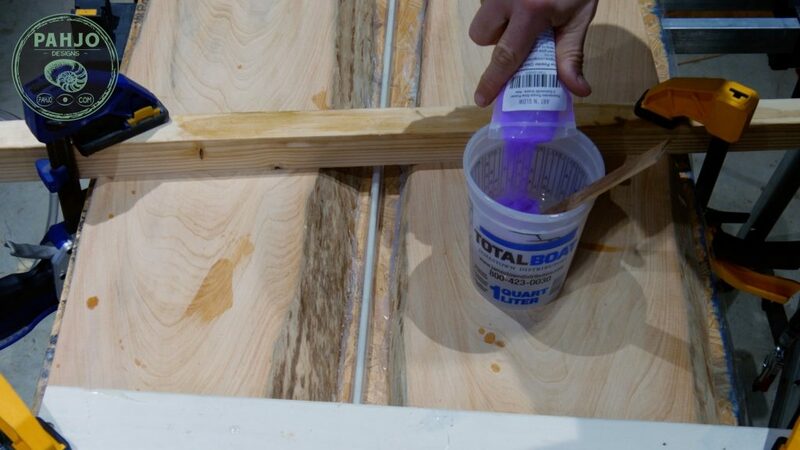 First, I mixed 22 ounces of resin and poured it on the LED epoxy resin wood wall art. Then, I removed bubbles from resin using my heat gun. Finally, I let the epoxy resin cured for 24 hours. 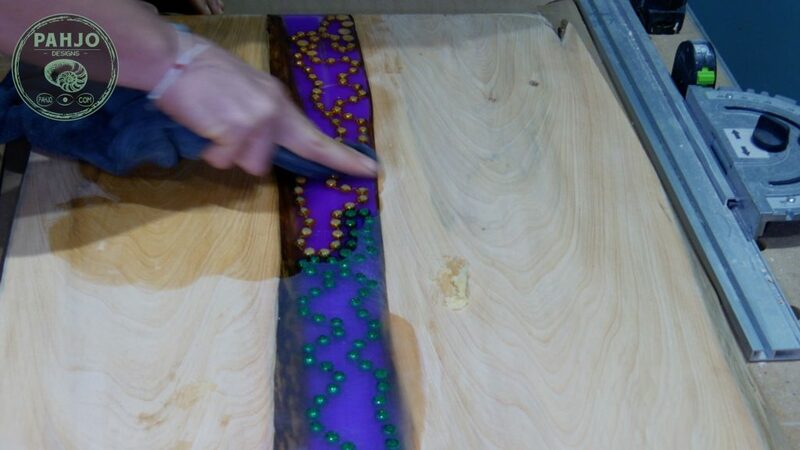 First, I used my rubber mallet to remove each end of the resin mold. 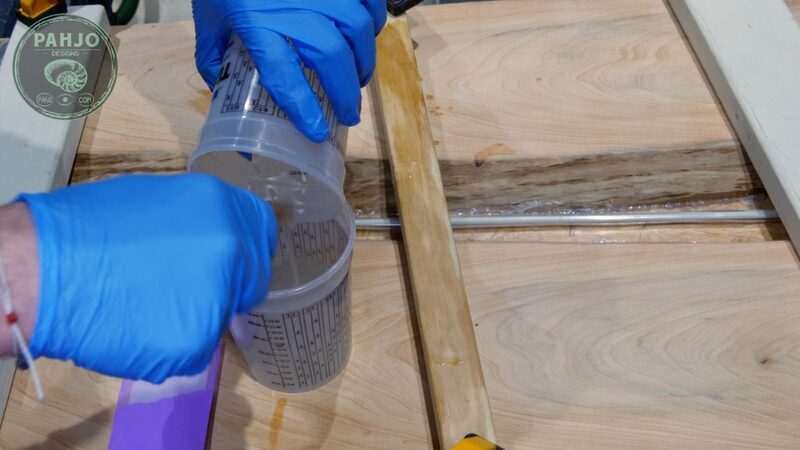 Next, I simply lifted the resin wood wall art from the resin mold. It popped off the packing tape with little effort. First, I used my track saw to cut 1″ off of one end. Next, I used this straight cut as a reference and used my tape measure to make marks at 33″. Then, I used my track saw to cut along the lines. 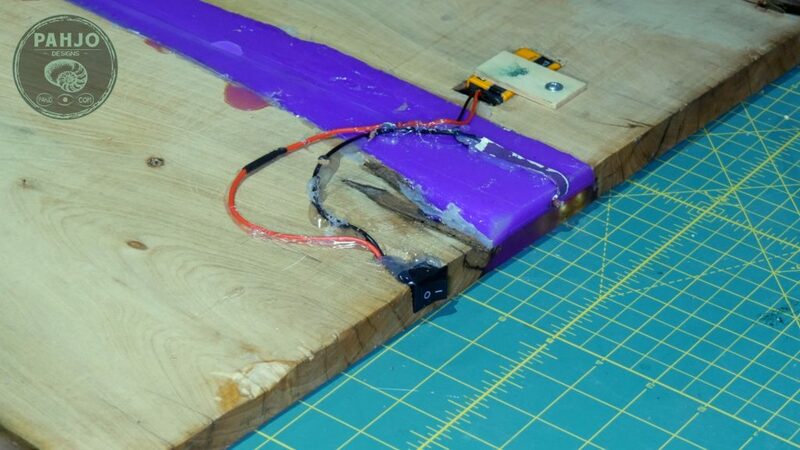 Don’t forget to visit my embedding LED lights in resin and learn how I removed the rod in the picture below. 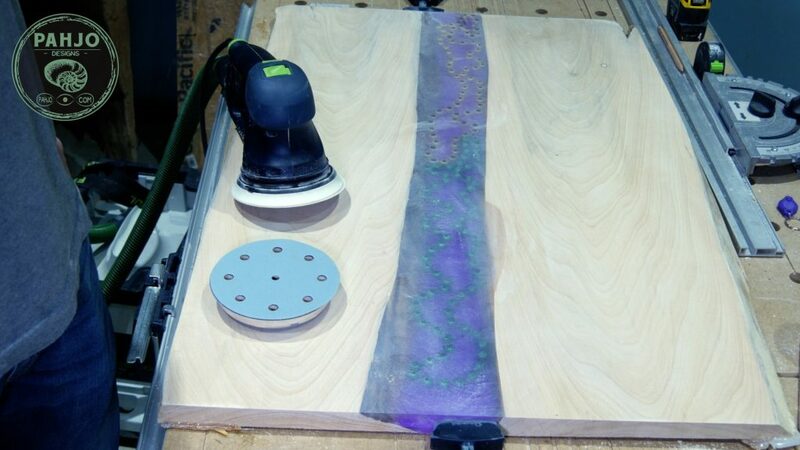 I decided to use my router and router sled to flatten the LED epoxy resin wood wall art. Also, I thought I hit record on my camera to capture this step. However, I realized after I did not. 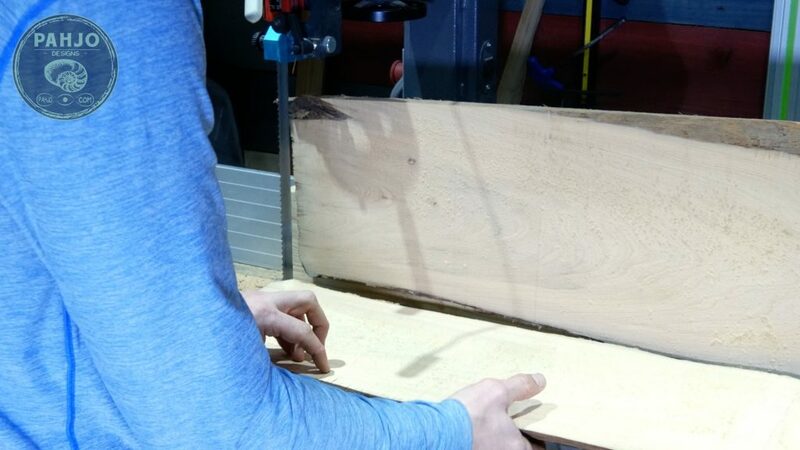 I quickly realized after the first few passes with my router that I set my router bit about 1/16th too deep. Consequently, I shaved off the top of the Mardi Gras beads. Ultimately, I contemplated scrapping the entire thing and started from scratch. However, I kept encouraging myself there has to be a way to fix this. The remedy to this problem certainly would not reveal itself to me while I was angry with myself. So, I decided to sand the wall art and call it a day. 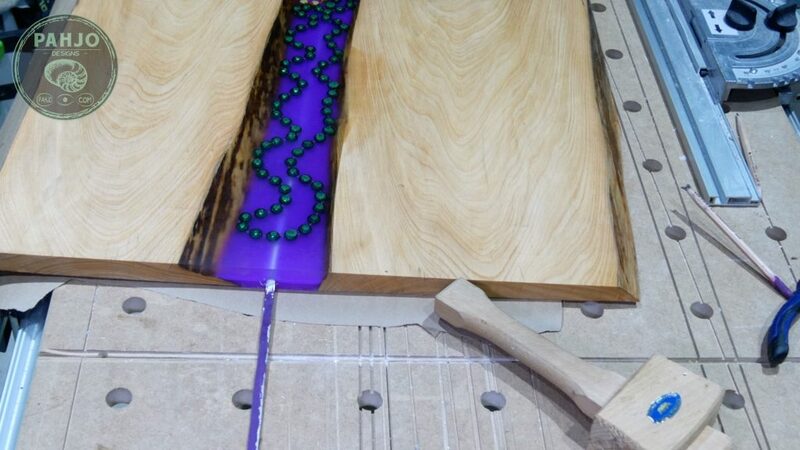 I used the same sanding technique for this LED epoxy resin wood wall art as I did on wood & resin baseball bat rack I built for my son. 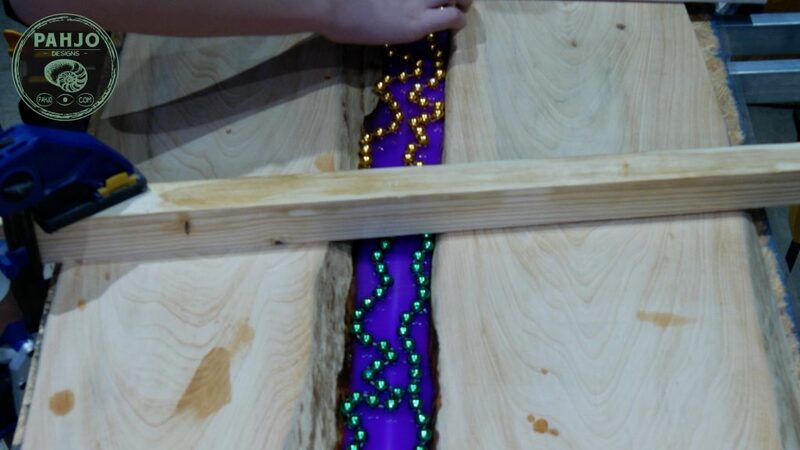 The picture below shows the top of the beads I accidentally removed as I explained in the last step. 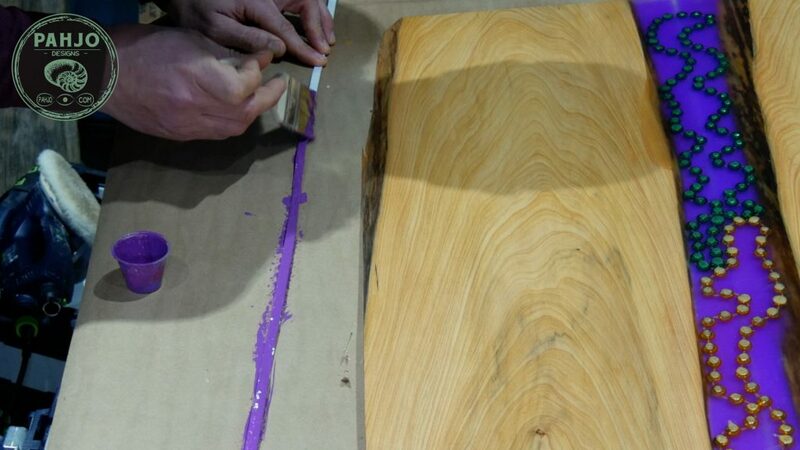 First, I started with 40 grit sandpaper for this resin wall art because the router bit left small lines. 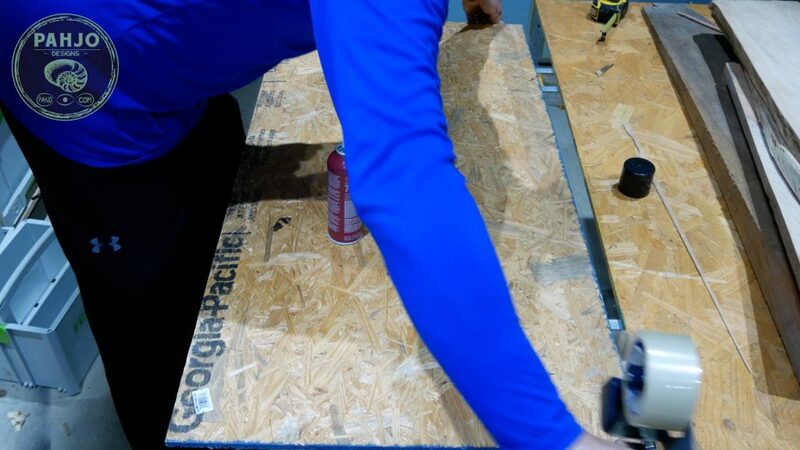 Next, I worked in 12″ x 12″ sections sanding horizontally then vertically in a tic-tac-toe pattern. 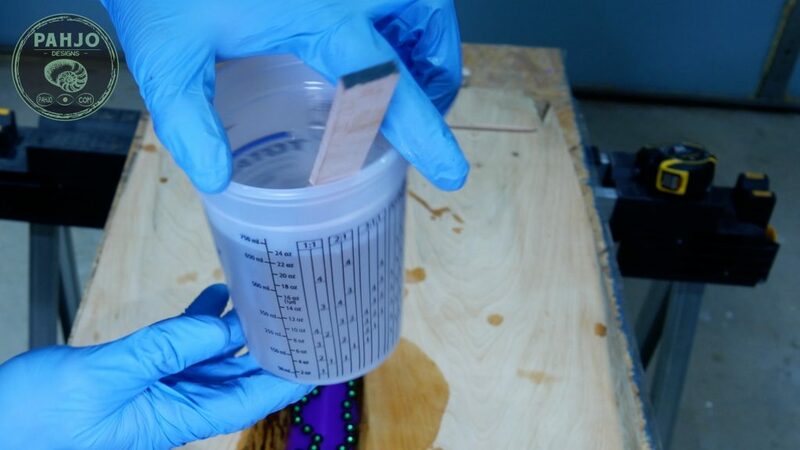 Then, I repeated the process for 60, 80, 100, 120, 150, and 220 grit sandpaper. 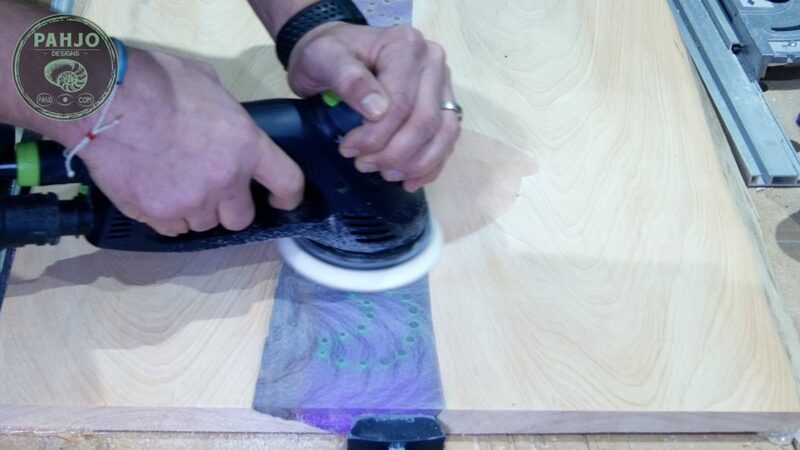 For the 320 grit sandpaper, I swapped the sanding pad in my sander to a soft sanding pad and repeated the process. The following day I came up with an idea. First, I mixed 4 ounces of epoxy resin and split the resin into 2 containers. 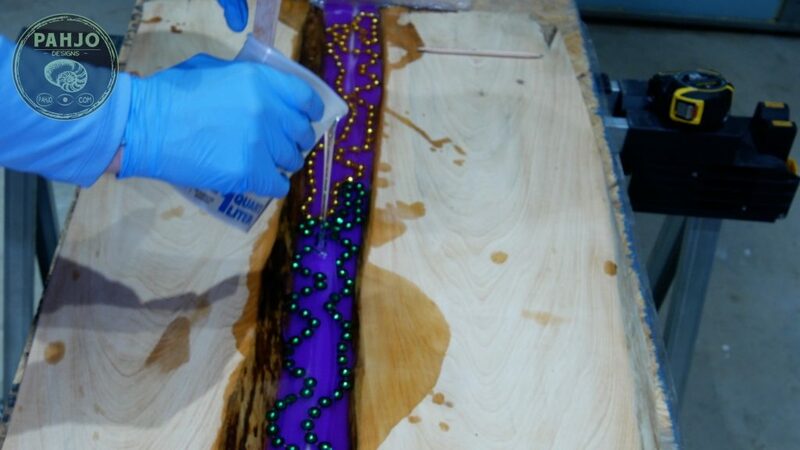 Next, I used metallic pigment to match the color of the beads. 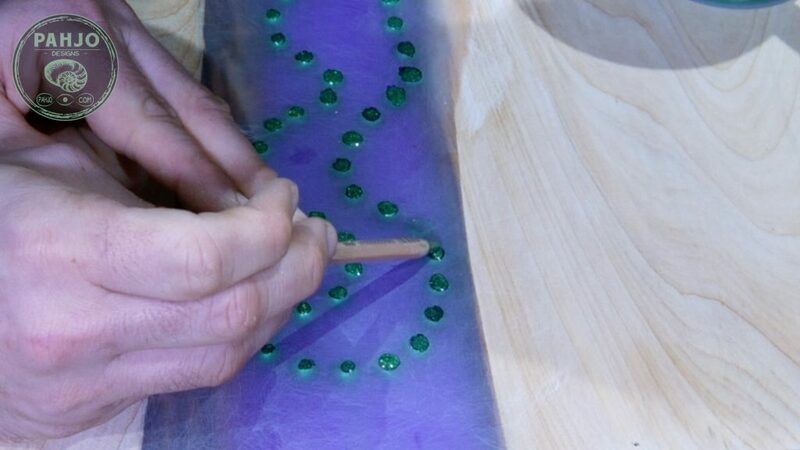 Then, I lightly placed the resin on top of the shaved beads as carefully as I could. First, I wiped the surface with a damp rag to remove the dust from sanding. 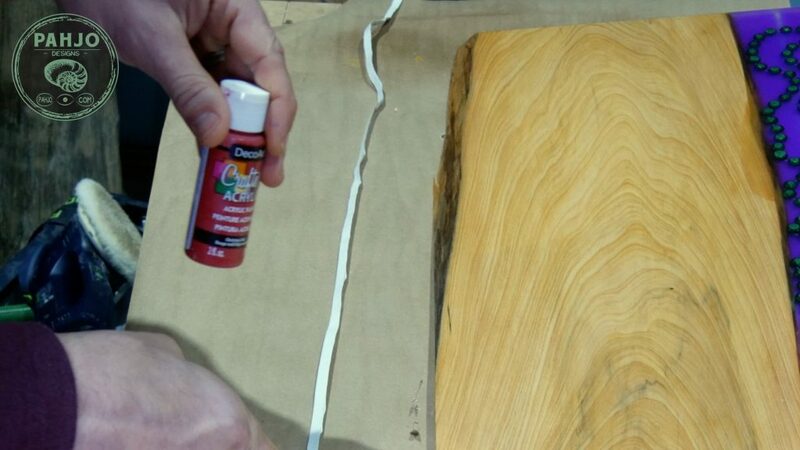 I used Odie’s Wood Butter as the finish for the LED epoxy resin wood wall art. This is my first time using this product and I was really impressed. Next, I used a paint stick to put clumps of wood butter in various spots on the surface. Keep in mind, this stuff goes a long way so I made sure to not use too much. 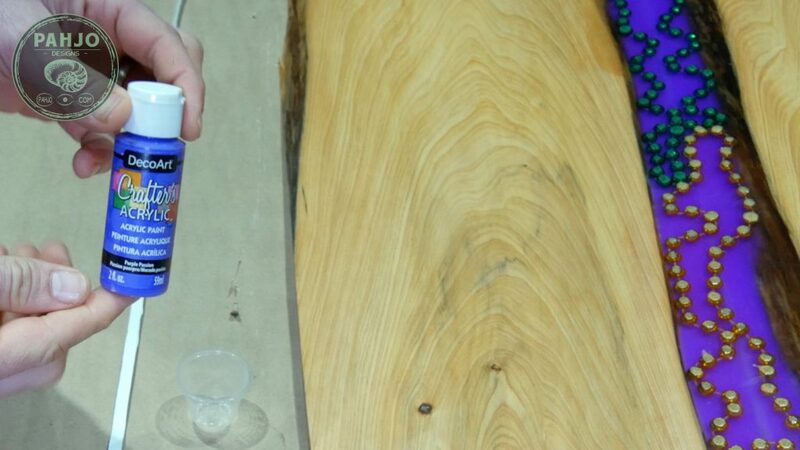 Then, I used a rag and worked the wood butter into the wood and resin. Once the wood butter set for roughly 30 minutes, I used my sander with a wool skin buffing pad to buff the wall art. I knew I didn’t completely cover the clear tube in purple resin as I intended, but I figured I would cross that bridge when it was time. Until now, I didn’t realize the rear of the LED strip is pure white. Houston, we have a problem! 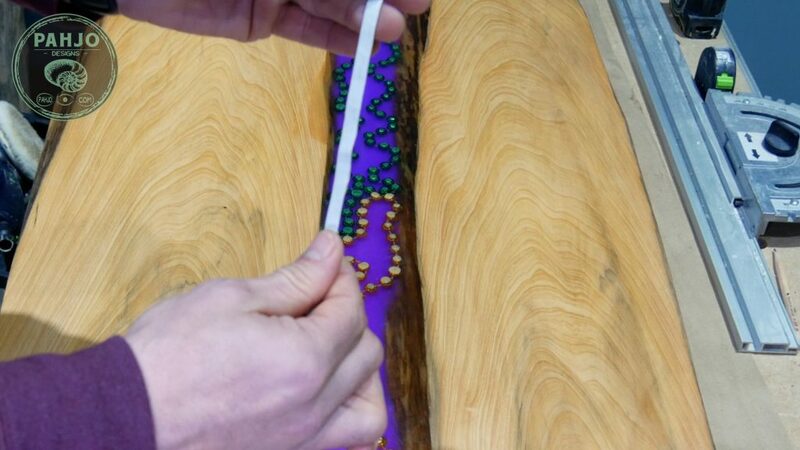 The LED lights are meant to point down facing the back of the resin wall art. 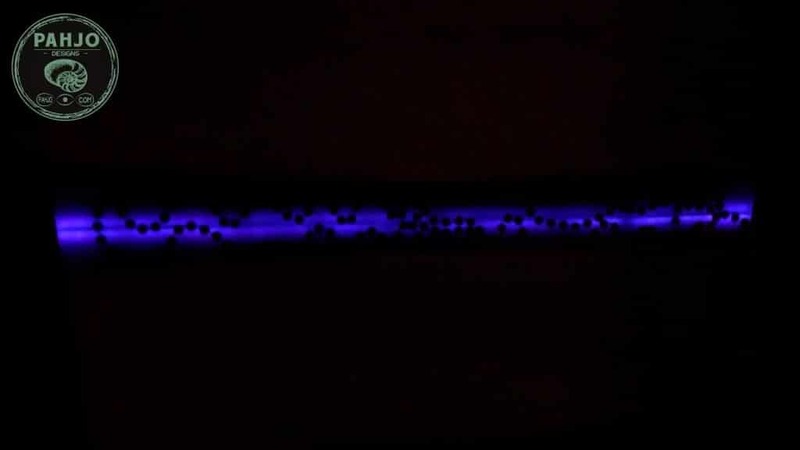 However, this exposes the white back of the LED strip and makes it look very silly. 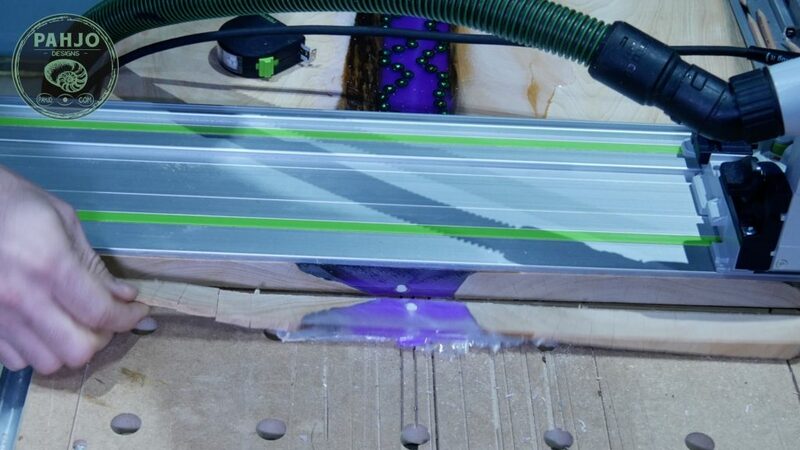 Essentially, the LED light strip would not be visible if it were encased in purple resin as I intended to do. Well, time to get creative and fix this. 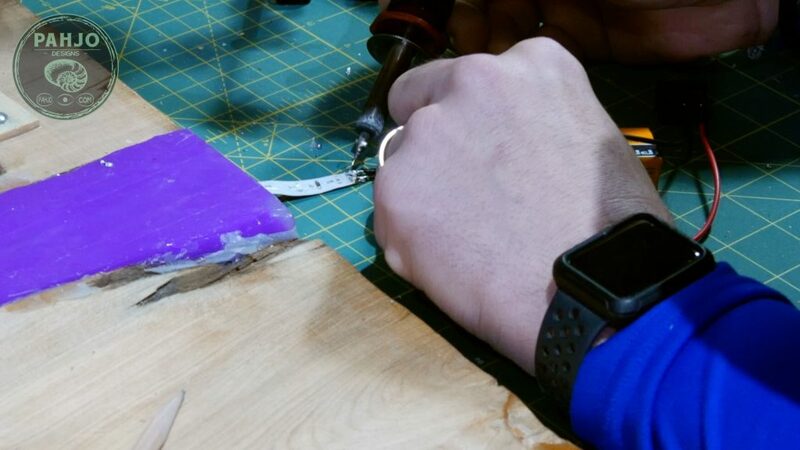 In order to hide the back of the LED light strip, I painted the back the same color as the resin. 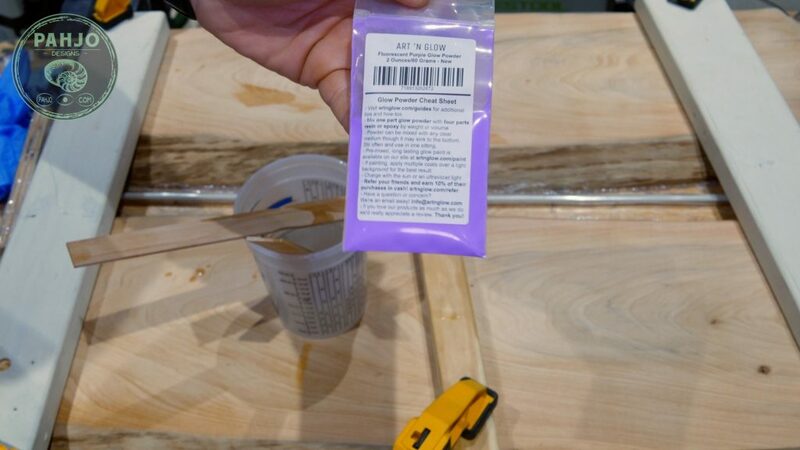 First, I tested the acrylic purple paint and it was not the same color purple as the resin. So, I mixed in some red paint with purple paint. The color looked like it needed more red so that’s what I added to it. This worked! It matched perfectly. Then, I painted the back of the LED light strip as best as I could with a chip brush. 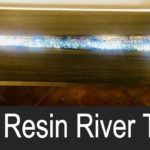 Finally, it was time to test my tunnel and install UV LED strip lights in epoxy resin. Although I used resin glow powder, it still needs to charge via natural light or UV black lights. Also, I choose to install UV LED lights on my resin glow projects in case light is minimal or non-existent. The LED light strip fit perfectly in the tube, which made it difficult to pull/push through. Next, I used the rod I removed in a previous step to push the string through the tunnel to the other side. Then, I tied the string to one end of the LED light strip and pulled it through. I cut the LED light strip between the 2 contact points with roughly 5″ of slack. 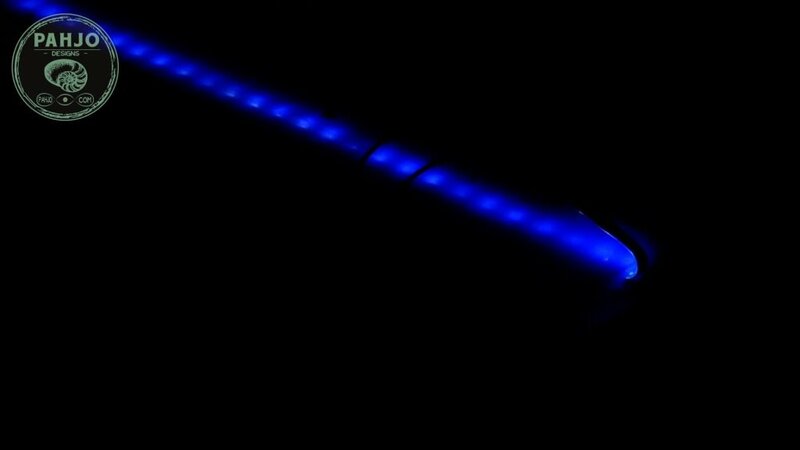 Although the UV LED light strip is 12v, I used a 9v battery to power it. Essentially, I figured this would work since I only used 2/3 of the LED strip. 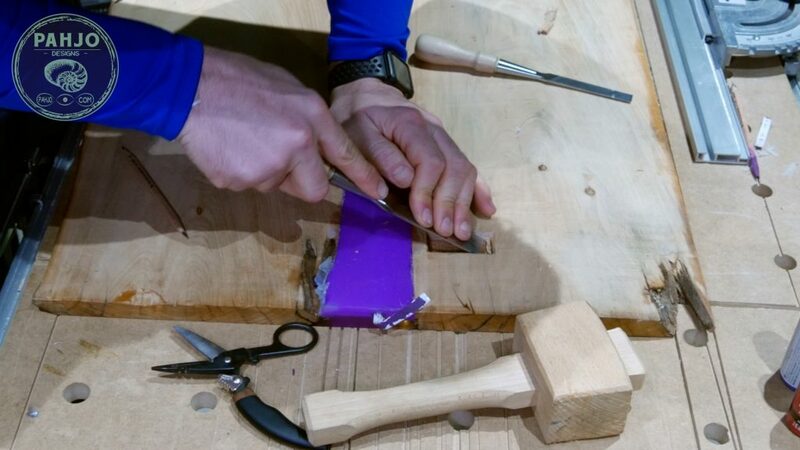 First, I flipped the resin wall art over and used my chisels to carve a rectangle in the wood the same size as the 9v battery. Additionally, I accounted for the 9v battery connector. I’ll elaborate more on this in the next step. 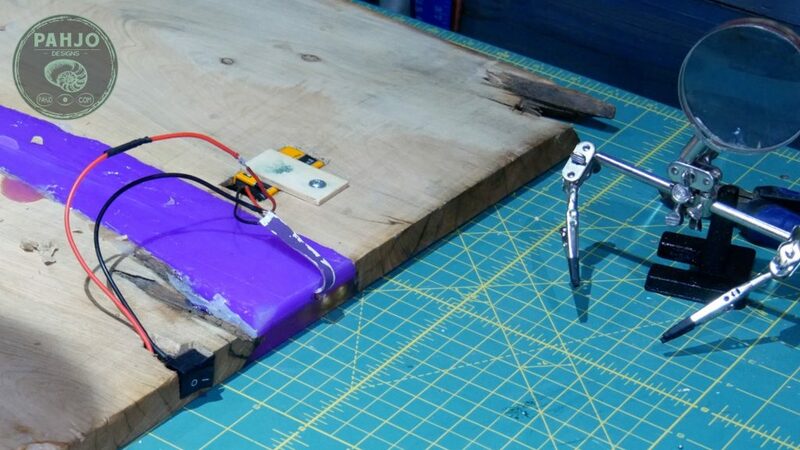 Then, I used a scrap piece of wood and a screw to construct a latch to keep the battery in place. 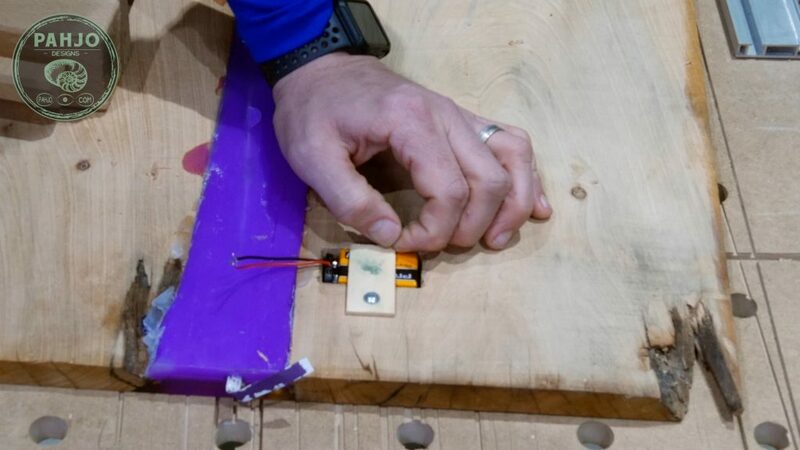 First, I used my helping hands to solder the toggle switch and 9v battery connector. Also, the wiring diagram and solder instructions are within the DIY plans. So, be sure to download yours today. 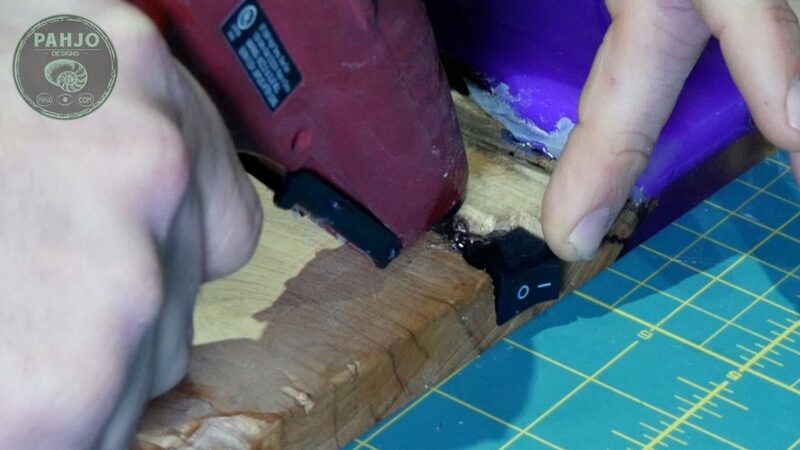 Then, I carved a section for the toggle switch and secured it in place with hot glue. Finally, I turned off the lights and tested the LED light strips while the resin wall art was upside down. In other words, this side won’t be seen. 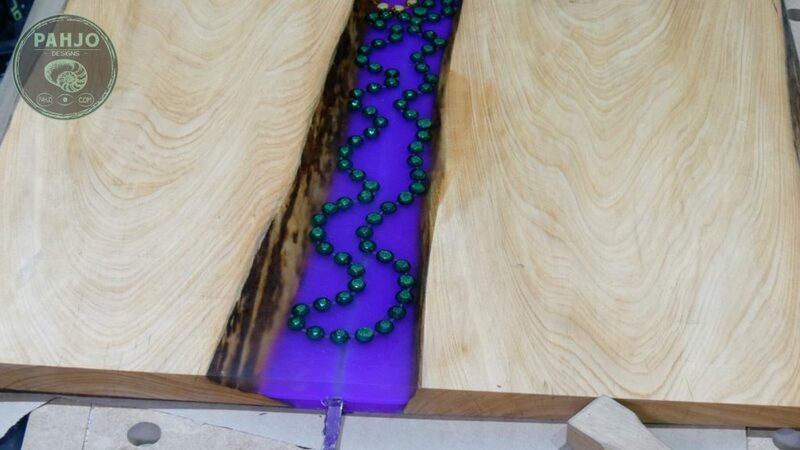 The picture below is a front view of the LED epoxy resin wood wall art. I failed a lot, learned a lot, and recovered enough to call this LED epoxy resin wood wall art project a success. 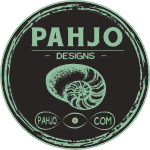 Also, checkout my online store for DIY plans and my handmade items for sale. In conclusion, I hope this post provided you with value. 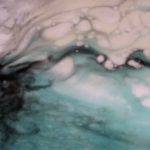 Be sure to visit my resin and wood beach art project. 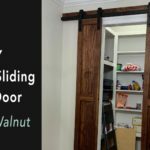 Feel free to leave a comment and let me know what you think about this project.